My first two days in the job have already begun to give a sense of the huge potential for developing the Trout in the Town movement. However, I use the phrase "begun to give" advisedly because there is so much potentially great work to be done out there. At the moment there are at least 7 projects that are already in train (at various stages of progression). I will be poring over the details of each of these (along with the details of a similar number of prospective projects) and meeting the various activists driving these projects over the next couple of months. 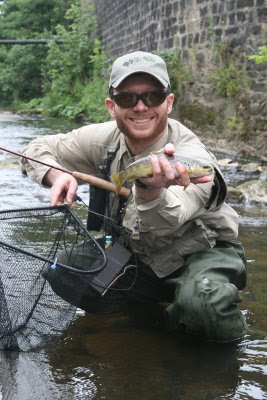 As an amazing treat, I had the privilege of fishing the wonderful Lancashire Colne along with the WTT director yesterday; before meeting with the local stakeholders (lead by the trusty Andy Pritchard). These guys have already hauled around 3 tons of scrap out of the river during one of their clean ups and we are drawing up battle plans for the continuing restoration on this cracking river. 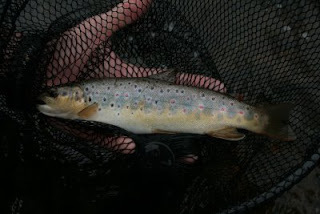 We were delighted to catch some absolutely stunning wild brown trout right in the urbanised centre of this post-industrial Lancashire river. Great project and good luck Paul! Keep up with the reports, very interesting.